A great depiction of a crucial storyline in the character's history, this movie has a lot working for it, though Viper seems unnecessary and more time should have been spent in the central family conflict. This is a fine film, especially for character depth in the Extended Cut. My fave with X2 and X: DAYS. The film gave Hugh Jackman a chance to endear the character to a whole new audience. The Man With One Name finds his western hero groove, in the East. There's a long cinematic history entwining the samurai and the cowboy: Seven Samurai inspired The Magnificent Seven; Yojimbo begat A Fistful of Dollars; Tarantino trysted both traditions up the yin/yang with Kill Bill 1 (The East) and Kill Bill 2 (The West). All inspired Sukiyaki Western Django and The Good, The Bad, The Weird. 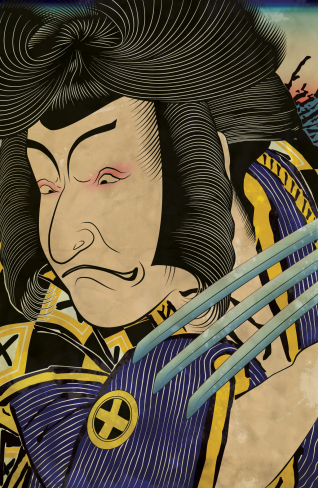 Logan comes to Japan to escape his past, and instead begins to redefine himself. WIthout mutant healing, he has to fend with his fists and wits; without his team, he has to face that his lonerism is an emptiness; without solace, he has to save his own soul. The best version of the film is the extended R-rated cut, which is especially notable for expanding the range and depth of Yukio and Mariko. It also deals more with Logan's grief over an event from X-Men 3 that is dealt with here better than that troubled production. The extended version of The Wolverine is one of the best entries in the X-Men series.